For the first time we are offering a limited selection of hand picked specials over the Seasonal period. 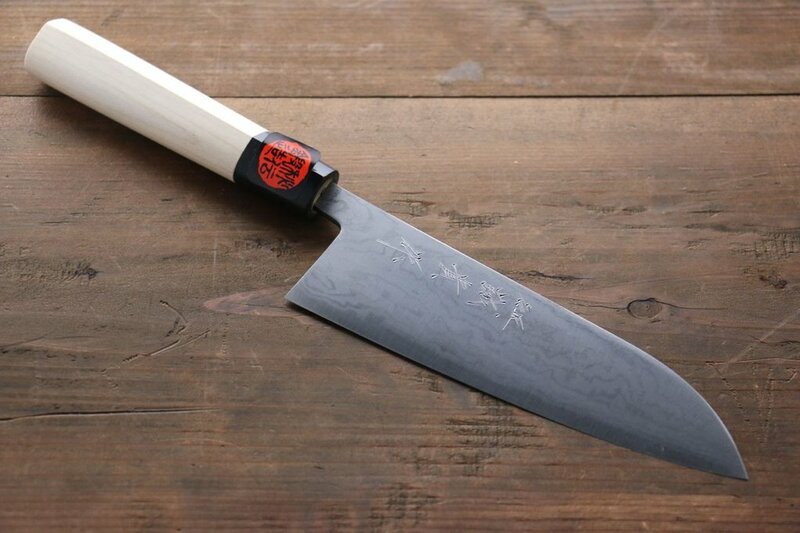 ​so please bear this in mind before ordering. 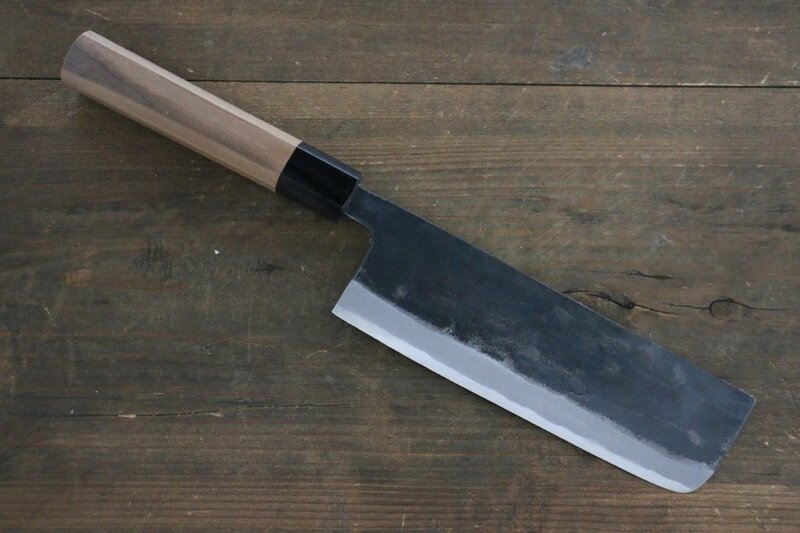 Know someone that loves BBQ? Looking for something completely different this Year? 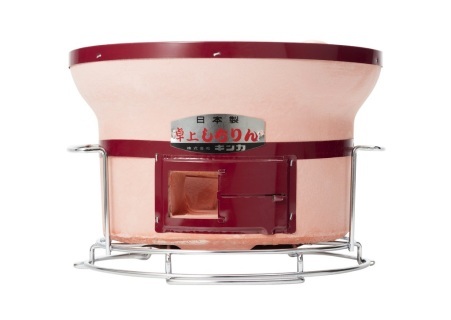 Based on the styling of a traditional Shichirin BBQ widely used throughout Japan, ​this little Grill is perfect for camping and festivals, even a well ventilated kitchen! Small but mighty, using the same Diatomite Earth found in our popular Konro Grills - known for it's outstanding insulating properties. Combined with metal handles and base for easy transportation. 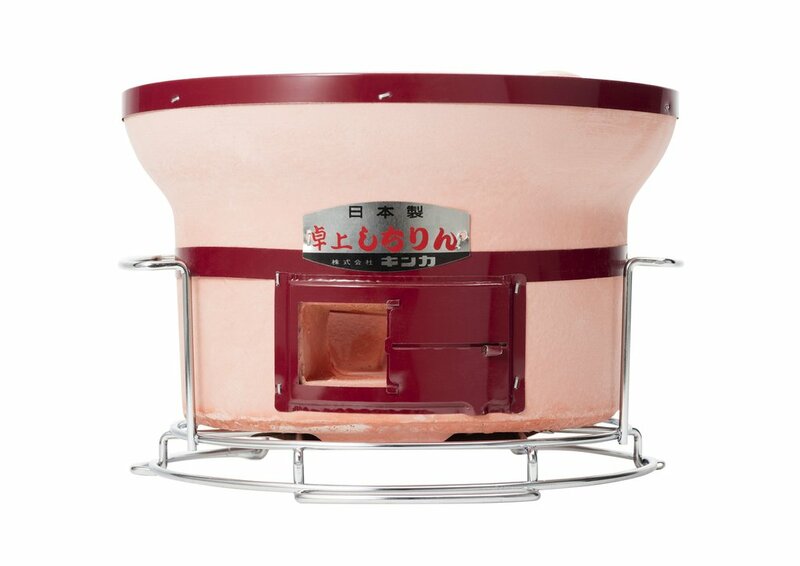 ​​*When used alongside our Sumi Bincho Briquettes the Shichirin will cook at a very even temperature, giving off very little smoke and minimal Flare up, not tainting the ingredients and staying Hot for a very long time. 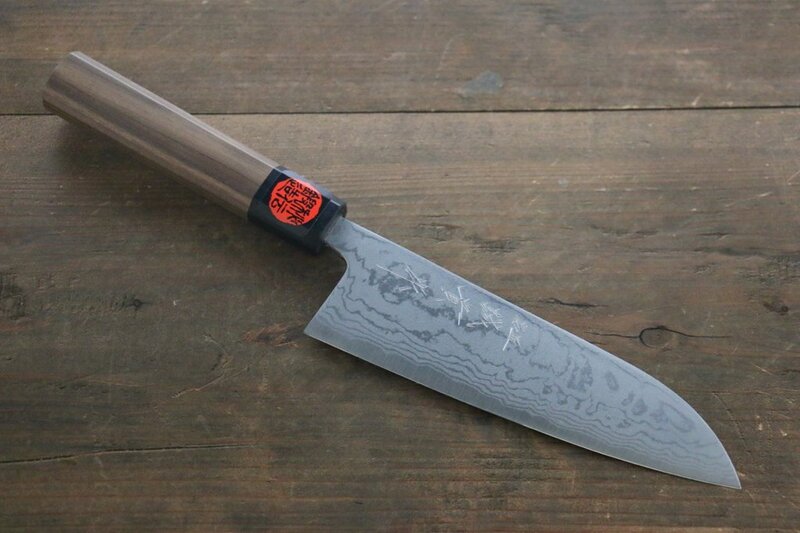 A stunning Stainless Steel version of the Yanagiba at just the right size, incorporating corrosion resistent Molybdenum (AUS-8) with added Vanadium which further increases strength, toughness and edge retention. 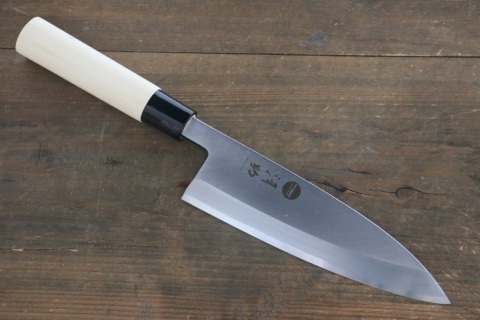 ​Complete with a Lacquered Magnolia Saya and Pin. 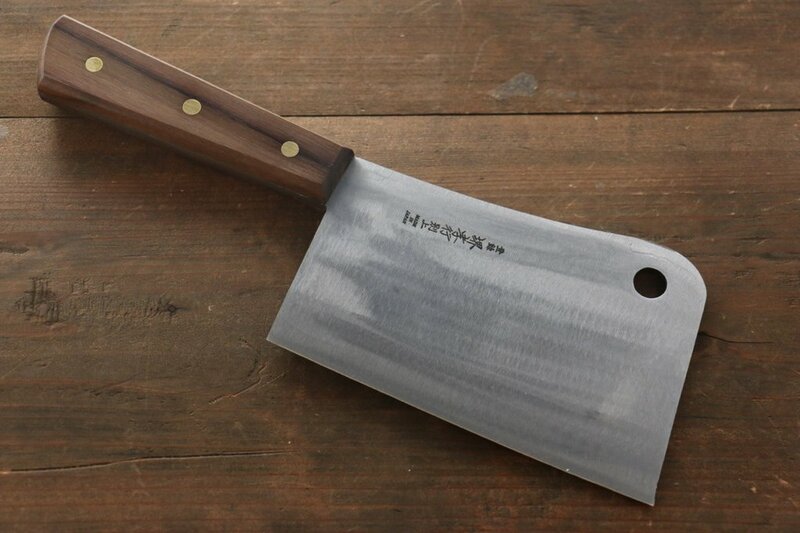 A limited addition Kengata Santoku with a stunning American cherry wood WA handle. 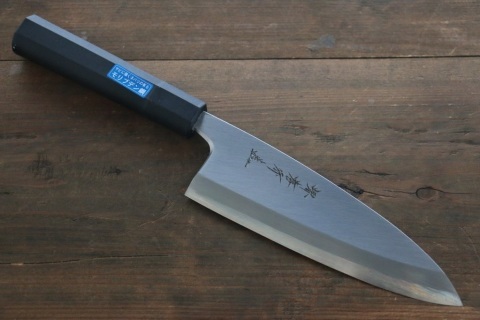 Light weight and beautifully balanced with a blue super steel core. A stunning piece. 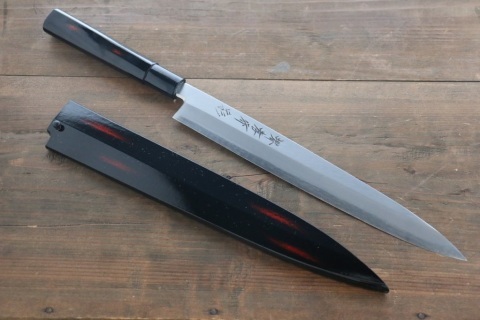 A very thick and heavy blade easily capable of cutting through bone and sinew. 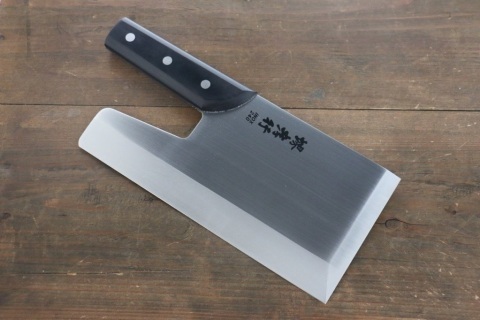 Familiar with butchers and professional Chefs. An essential addition to any kitchen when no other knife will do. A limited addition Cherry Wood WA handle paring knife from Sakai Takayuki with 33 Layer Damascus and VG10 Steel core. A perfect little knife ideal for those tasks when more precision is needed. 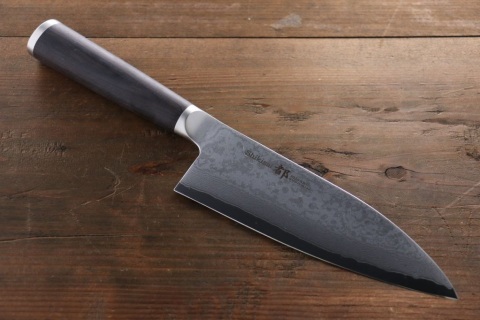 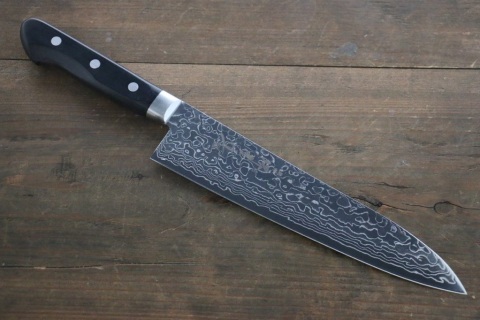 A lovely Nakiri in true Japanese tradition with a Black Kurouchi finish which minimizes corrosion. Aogami Blue Super steel #2 is about the best mix for high carbon steel knives and ensures a fine, razor sharp edge and smooth cut. 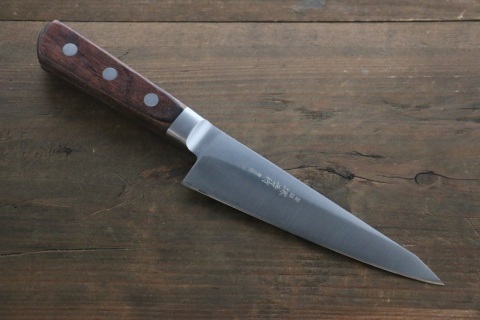 Light weight well balanced and a joy to handle. In the true tradition of Japanese skill and style this Santoku is as close as you'll get to the type of steel used for Centuries all over Japan. 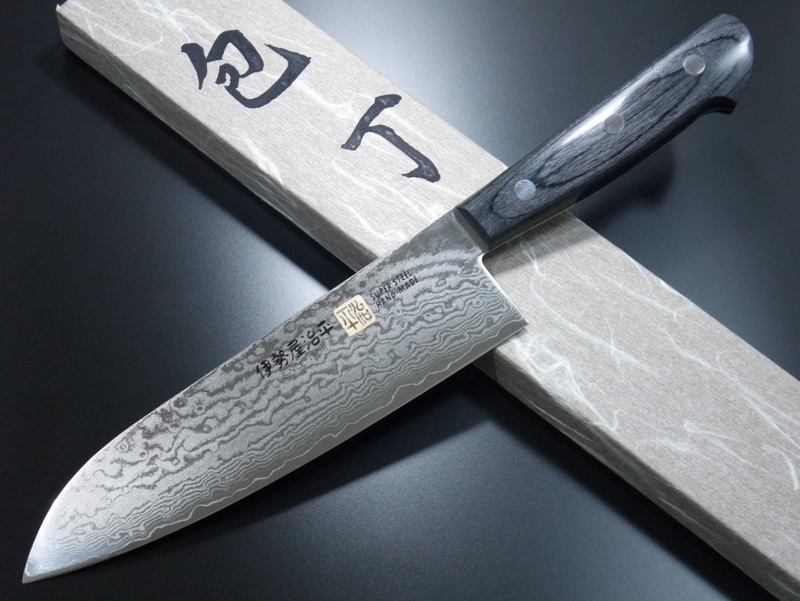 A Stand out chefs knife from Sakai Takayuki with a stunning 45 layers of Damascus, acid washed and polished to accentuate the wave effect of the hammering and layering of steel. 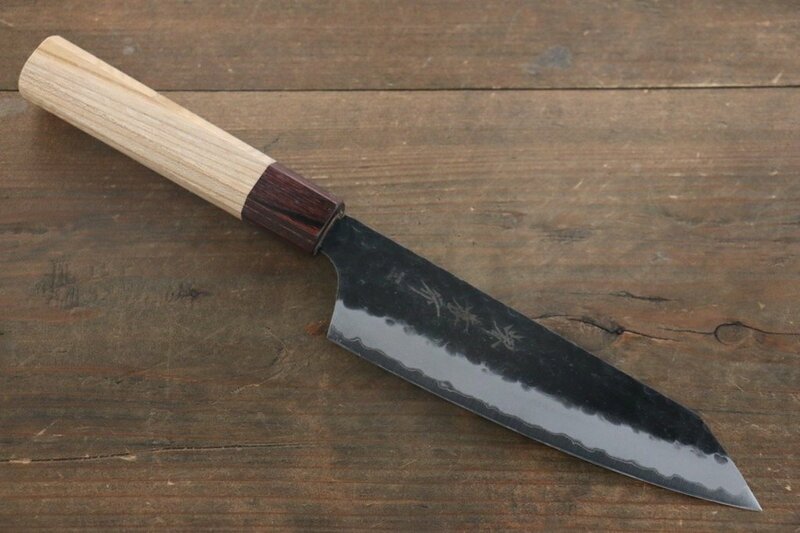 Full Tang and carved ergonomic handle for those use handling a more western stle Knife. 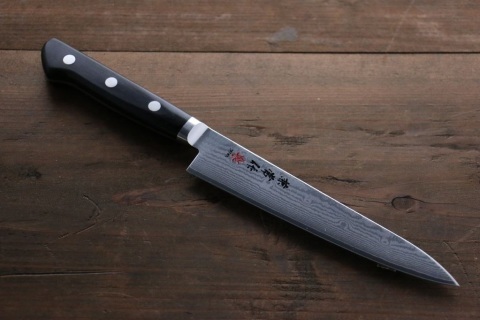 VG10 high carbon steel is the gold standard and a Chefs favourite exclusively produced in Japan. 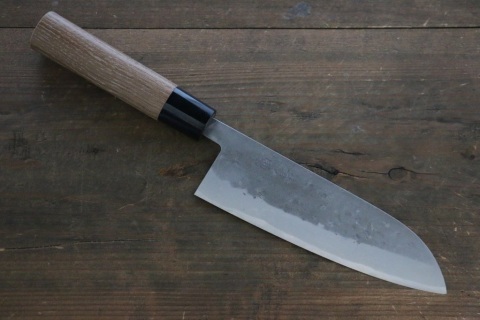 Superb edge retention, incredibly quick to sharpen and resistant to corrosion. Our most unusual knife to date and one of the most substantial I have come across. 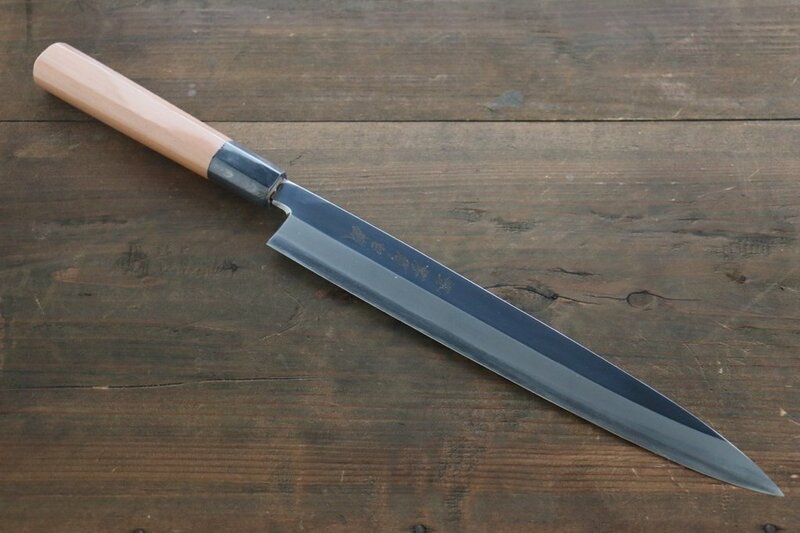 Specifically designed for cutting sheets of handmade soba noodles. 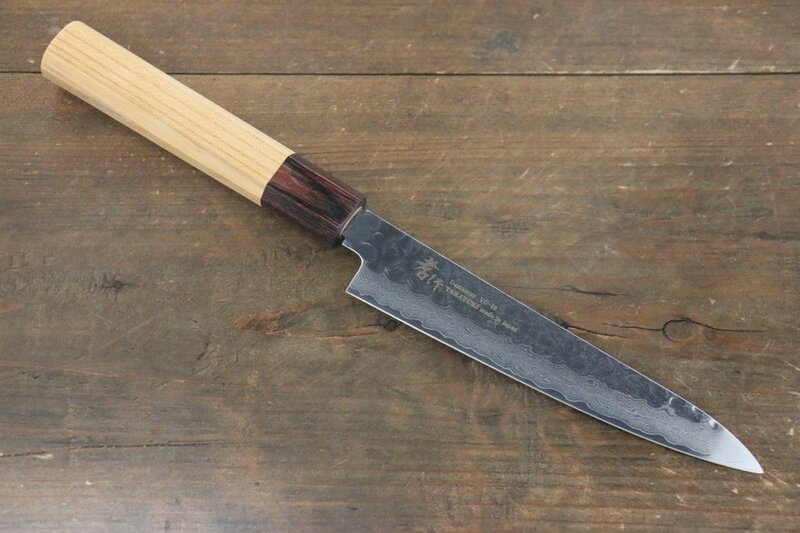 A very nice limited addition premium Yanagiba from Sakai Takayuki with a treated Yew Tree octagonal (WA) handle and Buffalo horn collar. 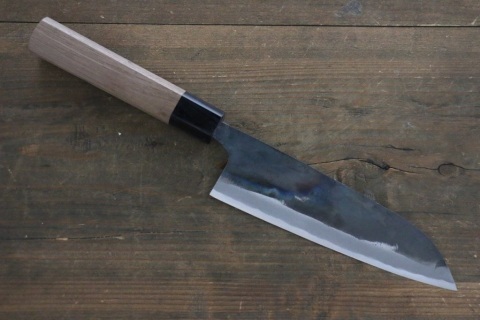 Made from a single piece of mirrored Hakugin Inox and a lengthy 270mm. A nicely weighted thick bladed knife traditionally used for breaking down meat and poultry but also a versatile sze that can be used as a useful utility knife.